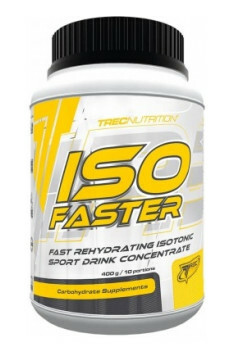 ISOFASTER is a perfectly soluble isotonic sports drink concentrate of refreshing flavour. A special composition of energetic ingredients and minerals was designed to offer your body with instant and efficient hydration. Not only does ISOFASTER quickly quench thirst and prevent dehydration, but it also replenishes the electrolytes that are lost with sweat, which is how the product protects your body against exhaustion during a hard and long-lasting workout. ISOFASTER is recommended for athletes who work out intensely, especially in endurance and speed endurance sports. Depending on the needs use 2-3 portions a day, preferably before, during and after training. It is best to use around training. Dissolve a single portion of the preparation – 40 g (5 scoops) in 500 ml of water. Pay attention to maintaining appropriate proportion between water volume and amount of concentrate. Too little amount of liquid or using too much preparation will contribute to the creation of hypertonic liquid. Strongly hypertonic solutions intensify liquid passing from bloodstream to intestines and additionally bind water, increasing the possibility of gastrointestinal disorders, diarrheas and nauseas. Premix of carbohydrates [Maltodextrin, Saccharose, Fructose], Acidity regulator (Citric acid), Flavors, Coloring agent (Beta-carotene).